The aftermath of the financial crisis and the associated asset market volatility has caused economists to reexamine the foundations of their theories. The dominant explanation for the Great Moderation is an economic paradigm called New Keynesian (NK) economics. That paradigm is built on three assumptions (Farmer 2010). First, the economy can be modelled ‘as if’ there was a single, infinitely-lived consumer. Second, monopolistic distortions and costs of adjusting prices mean that economic outcomes are not always ‘first best’. Third, Adam Smith’s ‘invisible hand’ guides the economic ship to a unique equilibrium outcome. 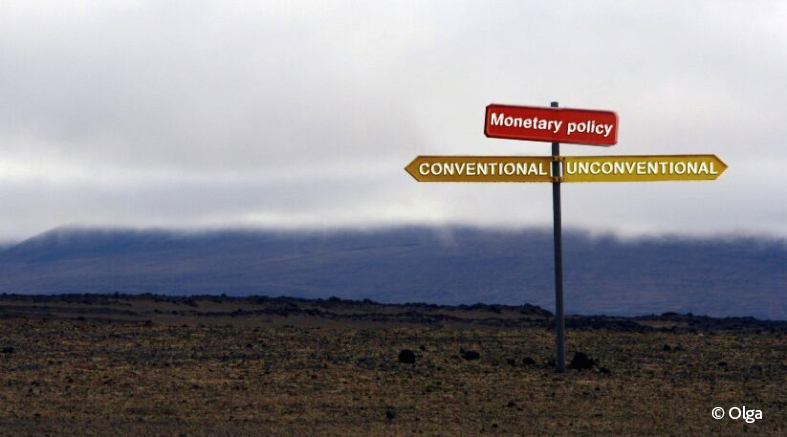 Our paper, ‘The Theory of Unconventional Monetary Policy’ is part of a broader research agenda (Farmer 2010, 2012, 2014, 2016, 2016) and focuses on the macroeconomic consequences of incomplete asset market participation. We replace the New Keynesian assumptions with three alternatives. First: consumers are not infinitely lived. The simple fact that there are many overlapping generations, and that people are born and die has important implications. For example, even in the limiting case where human beings could write contracts contingent on every conceivable future event, they would only be able to trade in those contracts after they are born (Cass and Shell 1983) – something conveniently assumed away in the standard NK model. Second: prices change frequently in micro data (Klenow and Malin, 2010) and the evidence for significant costs to changing individual prices is mixed at best. Drawing on this fact, we assume that all prices are ‘flexible’ and, in our model, price-setting is not associated with inefficiencies requiring government intervention. Third: monetary models do not have a unique equilibrium (Hahn 1965). In fact, our model allows for an infinity of equilibrium outcomes, as do many, if not all, general equilibrium models of money. (Examples include Farmer-Woodford 1997 or Benhabib-Schmitt-Grohé-Uribe 2000, 2001). The rational expectations assumption, which asserts that people do not make systematic forecast errors, makes sense when an economic model has a unique equilibrium. With multiple equilibria, however, many different views about the future could all be equally rational. We address this issue head on by assuming, as in Farmer 2013, that beliefs are fundamental. To model belief formation we use the ‘belief function’, an approach that originated in Farmer (1999, 1st ed. 1993). The belief function is a heuristic forecasting rule based on data. While the belief function need not, in general, implement a rational-expectations equilibrium, the two are perfectly consistent in our framework. We allow beliefs to be contingent on the realisation of a non-fundamental random variable. This variable (Cass and Shell refer to it as a ‘sunspot’), is observable and it might, for example, represent the opinion of an influential writer for the Financial Times: in one state of the world, the opinion piece in the Financial Times causes the price level to be low and in the other state of the world it causes the price level to be high. We draw out the implication of these assumptions for the theory and practice of monetary policy. Our main claim is that it is not just the size of the monetary base that matters for inflation and employment; it is also the composition of the monetary base between risky and safe assets. To substantiate this claim we use a simple model described in more detail below. There are two periods, two types of private agents: workers and entrepreneurs, and two public agents: a central bank and a treasury. Workers are alive in both periods and they are each endowed, in period 2, with one unit of leisure. Entrepreneurs are alive only in period 2. They are endowed with a technology for producing a unique consumption good. The fact that we call these people ‘entrepreneurs’ is not important as in a more complicated model with multiple periods and long lives, there would be people of all types present in all periods. What is most important is that not all agents can participate in asset trade. The people present in period 1 are aware that prices may be high or low and they trade two assets which are contingent on that possibility. One is a fixed nominal claim that we call debt and the other is a claim on future GDP that we call equity. The fact that entrepreneurs are excluded from trade in financial markets is sufficient to imply that, even when there are complete markets, uncertainty may still lead to Pareto inefficient outcomes. People born in period 2 would prefer to hedge against booms and busts and the associated asset market volatility and, if they were able to effectively insure themselves by trading financial assets, the effects of price fluctuations on output and employment could be avoided. In this model, booms and busts are driven by interactions between monetary and fiscal policy. Like any finite horizon model featuring money (Starr 1974), our framework must explain why money has value in the last period when everyone is aware that the world is about to end. We assume, in common with the previous literature, that money may be used to repay tax obligations. It follows that the value of money in the first period depends on what people believe it will be worth in the second and final period. We model fiscal policy as a nominal transfer to the people who are active in period 1. This transfer must be repaid by everyone alive in period 2 including those who are born in period 2 and who did not receive the transfer in period 1. Because the debt is valued in monetary terms, different price levels in period 2 impose different real tax burdens in period 2. It is this fact that causes self-fulfilling beliefs, enforced by contingent trades in financial assets, to have different implications for real economic outcomes. Although our model is stylized, the mechanism we highlight is not. It is well known that unanticipated inflation redistributes resources from lenders to borrowers. What is new in our work is that perfectly anticipated inflation redistributes resources from current to future generations when asset market participation is incomplete. Our paper offers an important lesson for the operation of future monetary policy. We explain why central bank interventions that change the maturity or risk composition of the balance sheet may be Pareto improving: central banks are in a unique position to carry out trades of risky for safe assets on behalf of those unable to trade for themselves. This might be because frictions prevent people from borrowing against uncertain future income, or, more dramatically, because they have not yet been born. What form should central bank interventions take? Following the 2008 financial crisis, the Bank of England purchased long-dated securities and the Fed purchased mortgage backed securities. In our model, it is entrepreneurs that are excluded from the asset markets, and as a consequence, their equity income is excessively volatile. The central bank can replicate the trades that the entrepreneurs would have made by swapping equity for debt, changing the composition of its balance sheet in the process. We do not want to draw too much attention to this specific result, since it depends heavily on unrealistic modelling assumptions that we made to illustrate a mechanism. We do, however, draw one robust conclusion. To the extent that asset market volatility is driven by shifts in beliefs, the central bank should aim to eliminate that volatility by engaging in countercyclical unconventional monetary policy, which would end up reducing the risk premium. Roger Farmer is a Distinguished Professor of Economics at University of California Los Angeles, Department of Economics. Pawel Zabczyk works in the Banks Centre for Central Banking Studies. Next Post A cat, a hat and a simple measure of gobbledygook: How readable is your writing?